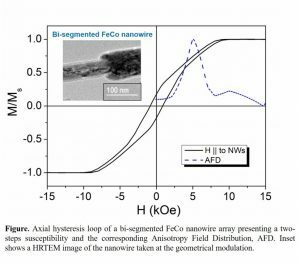 The magnetization process of hexagonal dense arrays of bi-segmented Ni and FeCo nanowires consisting of two well defined diameters (45 and 80 nm) are reported. The nanowires were grown inside of tailored pores of anodic alumina templates by combined anodization, atomic layer deposition (ALD) and electrodeposition. The results clearly enable to identify a two-step process ascribed to the respective segments of different diameter, as concluded from the differential susceptibility of the loops, and confirmed by the first-order reversal curve (FORC) distribution diagrams, where an elongation parallel to the interaction axis around two coercive field values is obtained. This well-defined two-step magnetization reversal process through the nanowire diameter design represents a promising route for the advanced control of the remagnetization in arrays of magnetic multidomain systems. This study performed in collaboration with the University of Oviedo has been supported by the Spanish Ministerio de Economia y Competitividad (MINECO) under the coordinated research Projects MAT2013-48054-C2 and MAT2016-76824-C3. 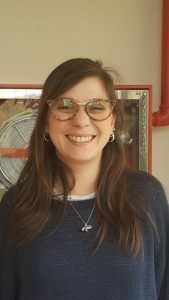 Soledad Aprea, PhD student from the National University of Cordoba (Argentina) is incorporated to the group until September 15th to work on “Magnetic Nanowires” under the supervision of Cristina Bran and Manuel Vazquez in the framework of the i- COOPB203017 project with that University funded by CSIC. Amorphous ferromagnetic microwires fabricated by in-water-quenching are assessed to show favorable properties as compared to those in sheet or ribbon form. In-water-quenched amorphous Fe75Si10B15 microwires prepared at ICMM/CSIC were subjected to aging up to 5 years time in air at room temperature. 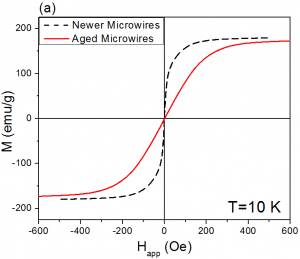 While both newer and aged microwires are X-ray amorphous, the aged ones exhibit a slight crystallinity degree, a lower initial susceptibility and a reduced enthalpy change for full devitrification. Such small differences (typically < 5%) are attributed to minor surface oxidation whose stress couples to magnetostriction to promote the formation of radial domains. 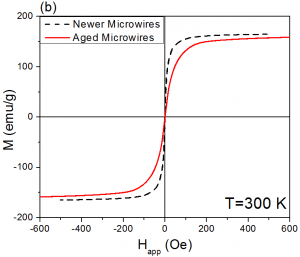 This study demonstrates that amorphous microwires are essentially stable against aging in the air, a key point for advanced applications for next-generation high-frequency electric machines. This article derives from the 2017 Sabbatical visit at the ICMM/CSIC of Prof. Laura H. Lewis from Northeastern University, Boston, funded by the National Science Foundation, U.S.A.
materials with strain. He will be in the group until March of 2021. Domain wall propagation in modulated-diameter cylindrical nanowires is a key phenomenon studied with a view to designing 3-dimensional magnetic memory devices. 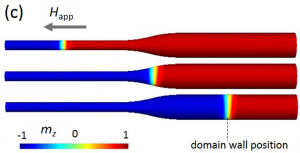 This paper presents a theoretical study of transverse domain wall behavior under magnetic field within a cylindrical nanowire with diameter modulation. Particularly, the domain wall pinning close to the diameter modulation was quantified, both numerically, using finite element micromagnetic simulations, and analytically. Qualitative analytical model for gently sloping modulations resulted in a simple scaling law useful to guide nanowire design when analyzing experiments. It shows that the domain wall depinning field is proportional to the modulation slope. 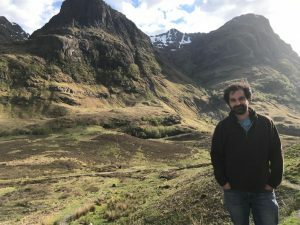 This article derives from the stay of Jose Angel Fernandez Roldan as PhD student in the laboratories of the Institut Louis Néel, Université Grenoble Alpes, CNRS, France supported by the Spanish MINECO within the collaboration established with Prof. Olivier Fruchart. Ni-Mn-Ga microfiber with a diameter of 80 μm was produced by glass-coated melt spinning method at the laboratories of ICMM/CSIC. Its martensitic transformation and reverse transformation temperature are 279 K and 290 K, respectively. 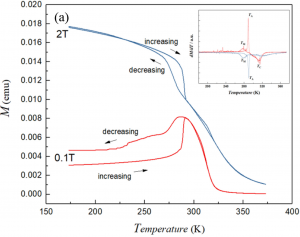 The as-cast microfiber shows nearly fully recoverable superelastic strain as large as ~10%, and perfect strain-magnetization effect, as the stress-induced martensite phase has lower initial susceptibility and higher saturation magnetization than the austenite one. This microfiber has large perspectives as non-destructive and non-contact monitor sensing material. This article derives from the stay of Yangyong Zhao in the GNMP group in 2017 within the collaboration established with Prof. Yong Zhang from the State Key Laboratory of Advanced Metals and Materials, University of Science and Technology Beijing, China. 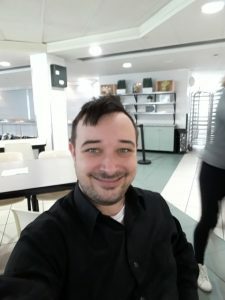 Associate Professor Mattia Butta is visiting us during the year 2019 to develop a project on “Magnetic microwires as sensing elements in orthogonal flux-gate sensors” supported by the Czech Technical University in Prague within its Bilateral Agreement with CSIC. We welcome Alejandro Armengod, student of 4th course of Chemistry Engineering (Universidad Autónoma de Madrid). He joins our group until 10th of May. 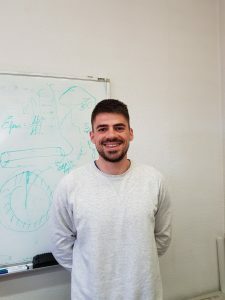 He is going to carry out scientific internship in the topic «electrochemist fabrication of magnetic multilayered Co-Pt nanowires» under the supervision of Manuel Vázquez and Cristina Bran. 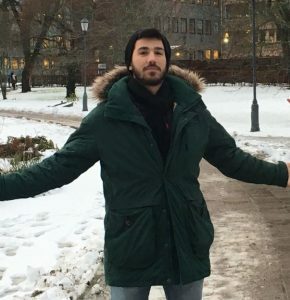 Elías Saugar Gotor will be in the group the next two years under the supervision of Oksana Chubykalo-Fesenko, researching on the modelling of ultra-fast magnetization dynamics. Our group has obtained the maximum calification (A-Excellent) in the last internal evaluation of all the CSIC groups. The evaluators highlight the good Spanish and International funding as well as the fundings obtained from technological companies. It is also remarked the scientific and technological activity together with a high level scientific training of PhD students.